The RA-400 Speaker/Microphone is made from impact resistant black plastic. The unit is water resistant with a Push to Talk Switch and Antenna socket. The Lead has Antenna plug and 7 Pin Clansman Audio Plug. The unit is designed to provide reliable two-way communications with a wide range of PMR, handheld radios and communication systems, including the Cougar secure radio system, and Clansman Radio Equipment that has a 7 pin Audio Connector. The microphone's design is optimised for hand-held operation and for minimum inconvenience to the user's clothing when in stand-by mode. The RA400 is supplied with an earphone socket, Ear Piece not Supplied enabling discrete reception of incoming signals. The case includes a spring steel clothing clip. 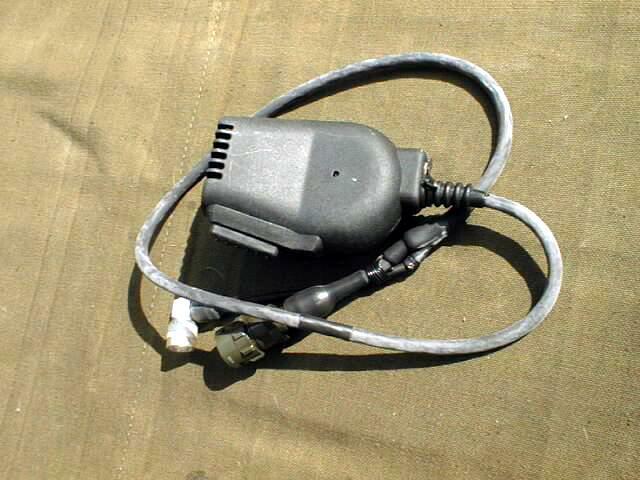 The RA-400 Speaker/ Microphone Part Number -712432 is supplied Brand New and with a Clansman type 7-Pin Audio Plug. It can also be used with other Clansman/Racal radio equipment which have the 7-Pin Audio Plug. Makes using a military set a pleasure, works great with PRC-349 ( Direct plug in ), and SEM-52 ( With some modifications ). Microphone Specifications: Transducer type: electret microphone with frequency shaping. Sensitivity: -60dBV/Pa at 1kHz, nominally when terminated by 300ohms. Frequency range: 200Hz to 5kHz. Impedance: 300ohms nominally at 1kHz. Supply voltage: 5V to 15V max. Supply current: 500?A max. with 10V Supply. Speaker Specifications: Transducer type: moving coil. Sensitivity: 86dB SPL at 1kHz nominally for 100mW input, measured at 200mm separation. Frequency range: 200Hz to 5kHz. Impedance : 8 ohms, nominally at 1kHz. Power handling capacity: 500mW peak max.